Ever wondered what lies behind the doors of 185 Bath Street? Steeped in culture and heritage, Glasgow Art Club has long been a private meeting place for generations of the city’s most innovative and creative inhabitants. Now, we are giving you the chance to see behind the scenes of one of Glasgow’s best kept secrets! Let our friendly and knowledgeable guides take you through the building to give you a fascinating insight into the history of Glasgow Art Club and its collections. 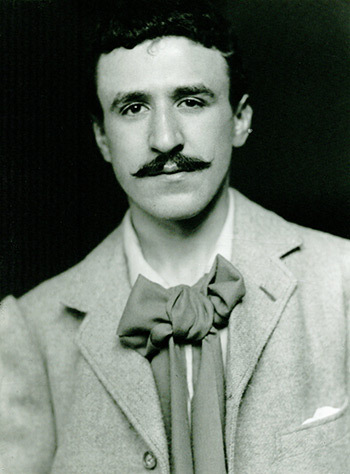 In 1893 two adjacent town houses on Bath Street were transformed by architects Honeyman & Keppie, employing Charles Rennie Mackintosh, into the magnificent Clubhouse which stands today. The Grade A-Listed Clubhouse is resplendent with historically significant interior features – many of which were designed by Charles Rennie Mackintosh when he was but 25 years old. Recent extensive refurbishment with substantial financial aid from The Heritage Lottery Fund and Historic Scotland with generous contributions from private donors, has resulted in restoration of the Club’s large Gallery to its original Victorian splendour. A must-see attraction for all Mackintosh enthusiasts is the recently recreated Mackintosh Frieze. Painted in 1893, the stenciled artwork was Mackintosh's first major public work and the centrepiece of the club's Gallery but due to water damage it was eventually plastered and painted over. A group of nationally recognised experts in the work of Mackintosh, in combination with a notable Scottish artist and a firm specialising in restoration work have combined to produce the stunning visual experience now on show. The Club also boasts an impressive collection of fine art paintings, sculpture and prints – much of which has never been on show to the public before. The collection includes work by Robin Hume, David Donaldson, Emilio Coia, Alexander Goudie, Bet Low and Francis Newbury. There will also be the opportunity for a brief visit to the Club Archives where the archivist, Angela Fussell, will provide a description of the selected archive gems on display. With so much to see, what are you waiting for? Book your place on one of our fascinating tours today! Tour participants can book in advance to enjoy lunch in our members' dining room. Please call us on 0141 248 5210 if you would like to book a table for lunch. Please arrive in good time, tours will begin at 11.30am prompt. £5 fee covers the cost of tea or coffee and cake.